MANDI GOBINDGARH, Nov 16  Excise and taxation officials, who have often been hoodwinked by traders using sophisticated technology to evade tax, are gearing up to fight back with the use of laptop computers at checkpoints. LUDHIANA: For the residents of Ludhiana, the fortnight-long sanitation drive (November 1-16) could not have come at a better time. LUDHIANA, Nov 16  The Punjab Sikh Lawyers Council today called upon the organisers of the Khalsa Tercentenary Celebrations Committee and the Badal government to seek the blessings of the Akal Takht Jathedar for this "historical event". AMRITSAR, Nov 16  The functioning of the mental hospital here is in a shambles. The condition of inmates in the hospital is deplorable as the state government has not yet released required amount for proper food for the inmates. BATHINDA, Nov 16  As many as 35 passengers were injured when a bus coming from Chandigarh overturned near Bhucho, 15 km from here today. CHANDIGARH, Nov 16  Junior engineers working in various departments, boards and corporations of the Punjab Government have demanded a pay scale of Rs 7220-11660 at par with junior engineers working in the Soil Conservation Department along with promotional scale after four-nine and 14 years of service. CHANDIGARH, Nov 16  A state-wide social mobilisation campaign will be launched in Punjab from November 17 on awareness about pulse polio immunisation. CHANDIGARH, Nov 16  Mr Arvind Khanna, who recently joined the Congress party after quitting the Shiromani Akali Dal, said here today that people were fed up with SAD-BJP Government in Punjab as it had failed to fulfil promises which were made on the eve of the last Vidhan Sabha elections. AMRITSAR, Nov 16  The 10-day-old agitation of gazetted and non-gazetted officials of the PWD Department was suspended today after an assurance was given by the State Minister of PWD (B and R), Mr Harmel Singh Tohra, to a delegation of officials. The laptops, which are equipped with scanners, will serve a two-fold purpose. While they will scan a bill immediately which can be verified from the issuing authority the next day if necessary, they will also create master dealer files (MDF) of different companies which can be referred to at the press of a button at the naka itself. While scanning will ensure an end to using fake bills, the master dealer files will have relevant information about different companies. The scheme was introduced in this steel city in Fatehgarh Sahib district of the state last night. The pilot project is likely to be introduced in other districts of the state also once it is experimented here. A visit by a Tribune team here revealed truck drivers queuing up to get their bills scanned late in the night. Assistant Excise and Taxation Commissioner H.M.S. Rosha disclosed that trucks were allowed to proceed immediately on their journey once the bill was scanned in the computer. He said following this it was the duty of the ward inspector to check the authenticity of the bill with the issuing authority. He said already some companies were falling into the net of the excise officials as they could not tamper or get the bills destroyed by the truck operators once the goods reached their destination. Mr Rosha said small-time companies which had never earlier issued bills for heavy amounts and never paid much tax would find it difficult to explain their position once their entire company profile came on the computer. Mr Rosha said another advantage of this scheme was that it was trader-friendly. He said till date the main complaint of traders was that they were unduly harassed by being told to bring their bill books by excise officials making a check at various nakas. He said in a complete turnaround excise officials would now go to their premises to seek clarifications. The excise official said the scheme would be implemented in phases in Mandi Gobindgarh. He said right now excise officials were checking trucks by moving to different nakas. Trucks stopped coming towards the naka after some time as traders used cars called "passers" in excise parlance which were equipped with cellular phones and pagers to warn their comrades. Mr Rosha said in the next phase the Excise Department would go in for an indefinite siege by covering all exit points so that it could access the entire material going out of the city. The Excise and Taxation Department has also been chosen as the first department for implementation of the information technology scheme being undertaken by the Punjab Government. Under this scheme, about Rs 7 to 8 crore is likely to be spent on developing a revenue oriented and integrated management information system (MIS). The latest hardware and networking technology will be used to implement the scheme. Every ward in the state will be online and inter-connected. The Taxation Commissioner said the tax collection in Fatehgarh Sahib district had increased by 119 per cent in October this year as compared to the corresponding period last year. He said while Rs 2.17 crore had been collected last month Rs 99 lakh had been collected in October last year. Under attack from a variety of diseases and ailments, they had resigned themselves to their fate of suffering silently. Bursting at its seams, the megacity's sanitation system had all but collapsed. During the past few months, Ludhiana had earned the dubious distinction of being the most disaster-prone city of Punjab. First it was hit by gastroenteritis. Then came cholera. Dropsy too made its appearance followed by the frightening experience of smog. Not to be left behind, even Budha Nullah broke its banks inundating several residential colonies inhabited by tens of thousands of people, posing a serious health hazard to them. Now dengue too has made its appearance, highlighting like never before the crying need for a proper sanitation system in the city. 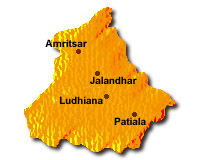 The sanitation drive in Ludhiana forms part of a statewide campaign launched by the Punjab Government on the first of this month. In Ludhiana, it was launched by the Minister for Local Bodies, Mr Balramji Dass Tandon. But it is a known fact that a mere fortnight-long drive will not solve the problem because the garbage is generated every day and has to be removed every day. Mr S.S. Sandhu, Municipal Commissioner, Ludhiana, says the objective of the drive was not only to clean up the city, but also to create awareness among the citizens about the need for sanitation. With this end in view, talks and seminars have been held in education institutions and processions organised by the school students. Mr Sandhu says the existing sanitation in the city is grossly inadequate to meet the requirements of the megacity. About 30 per cent of Ludhiana does not have transportation to ferry garbage on a daily basis. The city has only 11 loaders and 27 tippers to carry 850 metric tonnes of garbage generated every day. The city has 1,800 safai sewaks against the actual requirement of 5,300. But the financial situation of the municipal corporation is such that it is hard put to raise funds even for paying salaries to the existing safai sewaks. Therefore, recruitment of more safai sewaks is out of the question. "A realisation is sinking in slowly in the government that the answer to the problem lies in privatisation", says Mr Sandhu. It has, therefore, been decided that nearly 30 per cent of the city will be handed over to private contractors by the middle of December. "Our calculations have shown that each safai sewak costs about Rs 5,000 per month. The same job can be done by a private contractor for Rs 1,000 per month. We are also going to lease out our loaders and tippers to the private contractors, if need be," he adds. If the experiment succeeds, as it is bound to, says Mr Sandhu, the corporation will slowly hand over the rest of the city too to the private contractors for sanitation and transportation. As regards the sanitation fortnight, Mr Sandhu says all 70 wards of Ludhiana will be thoroughly cleaned at least once. Garbage dumps, which have come up over the years, will also be cleared, even if it has to be done after the sanitation fortnight. "Once we have a proper system in place, the problem of sanitation will vanish in due course", he adds. This has been stated in a press release by the ruling party MLA Laxmi Kanta Chawla. She alleged that reports prepared by an expert committee at the behest of the state Human Rights Commission were shocking as the patients were neither getting proper food nor adequate medicines. She questioned how patients of mental hospitals who had spent their youth, adulthood and middle-age in the hospital could be fed with Rs 8 per day when the prices of essential commodities had sky-rocketed. She further alleged that the decision of the government to increase the daily diet from Rs 8 to Rs 25 had not been implemented even after one year. Ms Chawla asked Chief Minister Punjab Parkash Singh Badal to order a probe into the non-implementation of the decision for the transfer of the mental hospital to the local Government Medical College. She said a report by the State Human Rights Commission had already stated that the inmates of the hospital were being treated by "quacks". As per the report, psychiatry does not constitute a separate subject in the curriculum for MBBS. Therefore, medical graduates after having passed their MBBS are virtually "quacks" as far as the management of mental diseases is concerned. The report says the strength of psychiatrists is far from satisfactory in the hospital. Ms Chawla urged the Chief Minister to order a high-level probe as 16 patients of the hospital had become blind. LUDHIANA, Nov 16  The Punjab Sikh Lawyers Council (PSLC) today called upon the organisers of the Khalsa Tercentenary Celebrations Committee and the Badal government to seek the blessings of the Akal Takht Jathedar for this "historical event". All celebrations should be programmed under the aegis of the Akal Takht with the involvement of the SGPC, popularly known as the Parliament of the Sikhs, the PSLC presidium said. While hailing the central and Punjab governments' support extended to the tercentenary celebrations, it condemned certain Akali political factions and individuals "who are ignoring the position and authority of the Akal Takht Jathedar, Bhai Ranjit Singh in the celebrations for their personal stakes." PSLC presidium members, Mr Gurdish Singh Grewal, general secretary, Mr Mohinder Singh Grewal, and secretary, Mr MIS Dhillon, have criticised all those who were trying to ignore the Jathedar of the Akal Takht. "The history is witness to the fact that all those who have challenged the authority of the Akal Takht or transgressed its tenets and faith in any way have not been spared by the Sikhs, whatsoever may have been their intention," said the Sikh lawyer activists. LUDHIANA, Nov 16  Dr B.S. Dhillon and Dr Sukhdev Singh, eminent agricultural scientists, have been appointed members of the Board of Management of Punjab Agricultural University for three years with immediate effect. The appointment has been made by the Governor of Punjab as per the notification issued by the Financial Commissioner, Development. Dr B.S. Dhillon is an eminent horticulturist of international repute. He has served PAU in various capacities, including, Dean, Postgraduate Studies, and Dean, College of Agriculture. Dr Sukhdev Singh has served the country as Agricultural Commissioner. PATIALA, Nov 16  The Punjabi University syndicate today constituted a five-member committee to give its verdict on the contentious issues of work load assessment in different teaching departments, re-employment of retired teachers and extension to employees working on an ad hoc basis. The committee, which will be chaired by the Vice-Chancellor, will have the state Education Secretary, DPI, Colleges, Dean Academic Affairs of the University and the Director, Languages Department, as members of the committee. Stating this to newsmen here after the syndicate meeting, Vice-Chancellor, Dr Joginder Singh Puar, said the committee would give its decision regarding the matter of re-employment of retired teachers as well as ad hoc appointees by December 31. He said the syndicate had allowed all employees working on an ad hoc basis to continue on the university rolls till December 31. He said the case of each employee would be decided by the committee and only those employees whose services were extended by then would be allowed to continue further. Cases not recommended for extension would automatically cease to be on the university rolls, he added. The Vice-Chancellor said the syndicate had decided that those who had retired after April 1, 1990, or opted for pension would be given the same. He said it would be necessary for them to get their benefits transferred to the university. CHANDIGARH, Nov16  At a blood donation camp organised by employees of Markfed as many as 143 employees donated blood, according to a press note issued here today. Mr Jagdish Singh Walia , Chairman, Markfed , who was present on this occasion called upon employees to continue such activities. CHANDIGARH, Nov 16  The Punjab Secretariat Cultural Society will organise a cultural programme on November 18 in Tagore Theatre in collaboration with the Punjab and Chandigarh Public Relations Department. Eminent Punjabi folk singers will participate in the programme. Mr Tarjinder Singh Dhillon, Secretary General of the Joint Action Committee of Junior Engineers, said here today that junior engineers were disappointed as the Government had excluded them from the engineering cadre while giving time-bound promotional scales. The Joint Action Committee, which has presented the case of junior engineers before the committee set up by the Punjab Government for the removal of anomalies, rejected the nominal and conditional benefits granted under ACP scheme recently. The JAC said the government had absolutely diluted the recommendation of the Fourth Pay Commission in case of JEs. CHANDIGARH, Nov 16  The Punjab units of the CPI and CPM staged a rally near the housing board roundabout to protest against the alleged kidnapping of a candidate for the post of sarpanch in the panchayat elections of Jalalabad village in Ferozepur. According to Mr Joginder Dayal, Prof Balwant Singh and Mr Mangat Ram Pasla, senior leaders of the units, Mr Kaka Singh was allegedly abducted by the police for not withdrawing his nomination against the Akali candidate. His whereabouts are not known since September 3. They have demanded a high level enquiry into the whole matter failing which a statewide agitation would be launched by them. This was stated by the Principal Secretary Health and Family Welfare Mr Rajesh Chhabbra, here today. December 6 and January 17 have been fixed for polio vaccination. On both days, children up to five years of age will be administered additional doses of oral polio vaccine, irrespective of their previous vaccination status. The Director , Health Services, Dr P.S.Jassi said over 30 lakh children would be vaccinated on these two days by a network of 15,000 service camps, manned by 62,000 health workers and volunteers from non- government organisations. FATEHGARH SAHIB, Nov 16  Jathedar Jiwan Singh Umranangal, a former minister, was born on October 1, 1914, at Dhaliwal bet in Kapurthala, district. He joined active politics in 1952 as a worker of the Shiromani Akali Dal. He contested and won all three elections of the SGPC and for 12 years remained a member of the executive committee. He remained minister in 1968 and 1977 Akali government. In 1980, he was elected as an MLA. He undertook a "pad yatra" for 45 days and visited those who had moved out of Punjab for fear of terrorists and persuaded them to return. He was awarded with Padma Bhushan by the President in 1991. He was also awarded Maharana Pratap Singh Award at Udaipur by the Rana Maward Foundation in 1987. People from every walk of life, including the Parkash Singh Badal, Chief Minister, and other leaders, will pay homage to him tomorrow on his bhog ceremony at Umranangal village. He said that people would give the SAD-BJP Government a befitting reply in the Adampur byelection for its failure on all fronts in the state. He said that rising prices had not only affected poor sections of society but also the middle and upper middle class. He said that the farming community was passing through the worst phase in Punjab. The delegation, led by the convener of the coordination committee, Mr Dina Nath Chauhan, met the minister in the SGPC office here and demanded cancellation of the government orders for shifting of the provincial division No 2 PWD B and R to Nawanshahr as that would cause dislocation of 150 families of office and field officials and disrupt the studies of their children. ROPAR, Nov 16  In compliance with the orders of the Punjab and Haryana High Court for closure of unlicensed shops, hospitals, quack shops, using unscientific medical practices for the treatment of drug addicts, the Anandpur Sahib police has registered a case against Harbhawan Singh, who runs Guru Nanak Hospital in Mangewal village, near Anandpur Sahib. Stating this today, Mr Ranbir Singh Khatra, SSP, Ropar, said that the case had been registered under Section 342 of the IPC, following a directive from the high court. Earlier, a judge of the court took suo-motu notice of a news report. All the inmates of this hospital had been handed over to their respective families and no such inmate was now residing there. The Civil Surgeon had been asked to inquire whether any such hospital or quack was resorting to using unscientific medical practices. The mental wing of the hospital had been closed. MALERKOTLA, Nov 16  A case of fraud on a bank by a local property dealer has come to light with the arrest of Harbans Singh, a property dealer, and Jagdambe Parshad, a clerk of the State Bank of Patiala (main branch) here. Giving detail of the fraud, today, Mr Indermohan Singh, DSP, told mediapersons that Harbans Singh opened bank accounts in the State Bank of Patiala (main branch), State Bank of Patiala, Kup Kalan, and the State Bank of Patiala extension branch, local Government College in connivance with Jagdambe Parshad. Harbans Singh issued a cheque for Rs 1.60 lakh to Mr Mangat Singh, a lecturer in Government College. Mr Mangat Singh presented the cheque at the extension counter of the State Bank of Patiala on May 13, 1998. The extension branch sent the cheque to the main branch of the bank for clearance. Despite insufficient funds in the account of Harbans Singh, the cheque was cleared by the main branch of the State Bank of Patiala the next day. According to the police DSP, police on a complaint by M.S. Jassi, chief manager of the main branch of the bank a case was registered against Harbans Singh, Mangat Singh, Jagdambe Parshad, R.K. Gupta another employee of the bank, and Mr K.K. Guru, manager of the bank under Sections 420/407/468/120B of the IPC. AMRITSAR, Nov 16 The police claims to have busted a gang responsible for printing and circulating fake currency notes with the arrest of five persons in a raid at a house in the Kashmir Avenue locality here yesterday. The SSP, Amritsar, Mr G.S. Sahota, told newspersons today besides computers and the colour laser printer used in printing currency notes of the denomination of Rs 500 and Rs 100 the police seized fake currency notes to the tune of Rs 1.83 lakh. The gang members are being interrogated to carry out further raids. Mr Sahota said the gang leader, Kewal Singh, Sarpanch of Jangala village in Batala district, fired at the raiding police party with a .12-bore gun. An ASI escaped unhurt as the gunshot went through his turban. The police seized the gun along with a dozen cartridges. Other equipment seized included one scanner, one jet printer, a lamination machine, one silver pen, one cutting machine and a huge quantity of blank paper used for printing of currency notes. The gang, he said, was carrying out this job for the past two and a half months. The police has registered a case. The arrested persons have been identified as Kewal Singh, his two brothers Apar Singh and Harpal Singh, Kulwant Singh and Kuldip Singh. Sources said the bus overturned when the driver could not control the vehicle while saving a scooterist. The team of local Sahara Welfare Club reached the spot immediately after the accident and shifted all the injured passengers into local civil hospital. Hospital sources said 31 passengers were allowed to go for their respective destinations after necessary first aid. The condition of four admitted in the hospital was stated to be normal.